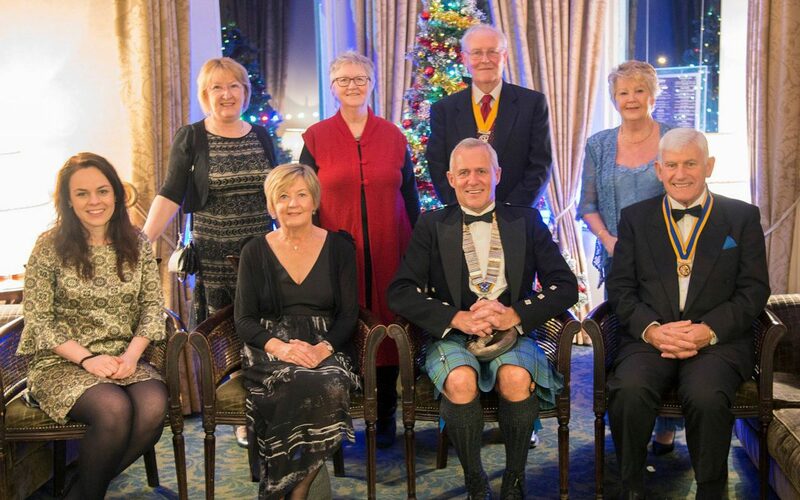 The Lochaber Rotary Club has awarded its highest accolade to local man David Robertson from Torlundy. David was Club President in 1998, he has chaired all of the Club’s committees during his 30-year membership, and has been a key figure in the 10 year run of the Club’s annual Christmas festival, putting a huge amount of time and effort into negotiating, organizing and co-ordinating the multitude of tasks and statutory consents that underpin what has become Lochaber’s premier annual event. David is only the fourteenth club member to be recognised in this way in the 67-year life of the Club. 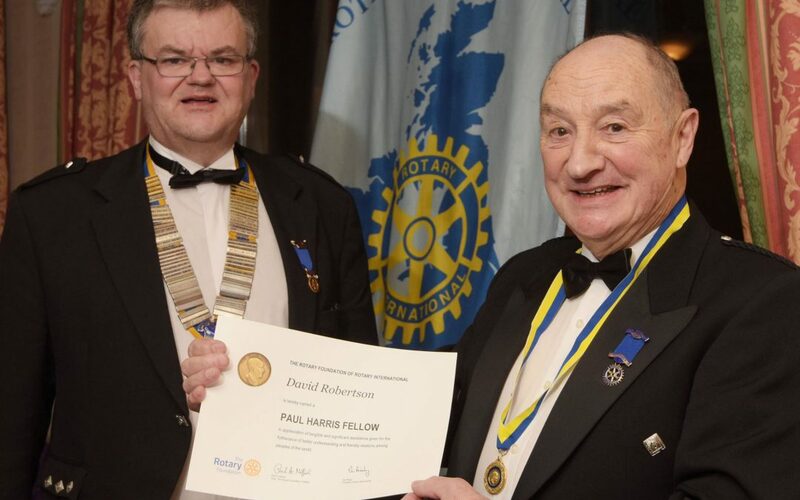 At the Club’s annual dinner on 2 December, a surprised David was presented with a ‘Paul Harris Fellowship’ for his exceptional dedication and contribution to the work of the Club and to the Lochaber community as a whole. Club President Donald McCorkindale, in presenting the award on behalf of the Club, stressed that Rotary’s highest commendation is “a tribute to these special people who demonstrate a special commitment to the work of Rotary” and added “it is a great privilege in my year as president to present you with this mark of appreciation”. In responding, David, still in shock, thanked the Club for this “wonderful” gesture and said he was proud to be a Rotarian. Club members and guests showed their appreciation with warm and sustained applause. 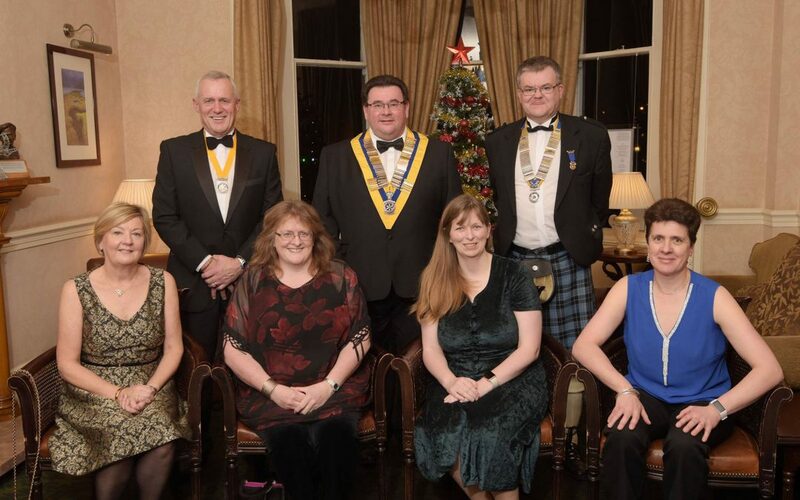 Nearly seventy Rotarians and guests enjoyed an excellent 4-course meal at the Club’s 67th Charter Night dinner held at the Alexandra Hotel, Fort William on Saturday 2nd December. Ably chaired by Club President Donald McCorkindale, the guest speaker was the modest yet multi-skilled and versatile Rosie Curtis who entertained everyone with an absorbing and wide-ranging talk. Rosie is a native of Kilchoan, the westernmost village on the UK mainland, and one of Scotland’s most remote settlements. After leaving school Rosie studied hospitality at Inverness College before her love of cooking led her to a 7-year stint at Nevis Range where she rose to the position of assistant manager. After the loss of her father, Rosie returned to Kilchoan to help support her family and the family croft. Achieving a sustainable livelihood with a small croft in Western Ardnamurchan was a challenge and, as well as crofting, Rosie used her energies to become an ambulance driver, ‘watch manager’ of the Kilchoan Retained Fire Crew as well as local Coastguard Officer. In 1997 Rosie joined Marine Harvest, firstly at their Glenmore sea farm site, then as assistant manager at their Laga Bay farm and, since 2014, as manager of a new sea farm at MacLean’s Nose near the mouth of Loch Sunart. On her appointment as farm manager, Rosie became the first ever female fish farm manager in Scotland. The farm now provides employment for 10 people and produces 1.2million fish every year. Rosie is passionate about salmon farming and this came through in her talk. She is determined to eliminate chemical cleaning in favour of the natural environmental process of using sea wrasse, which they harvest themselves from nearby sea waters. In 2015 Rosie was awarded ‘farm manager of the year’ at the annual Scottish Marine Aquaculture Awards. Rosie told the audience that she collected the award in her ‘salmon pink’ dress and added that “Marine Harvest is one of the best companies you could work for. They look after and encourage their staff. 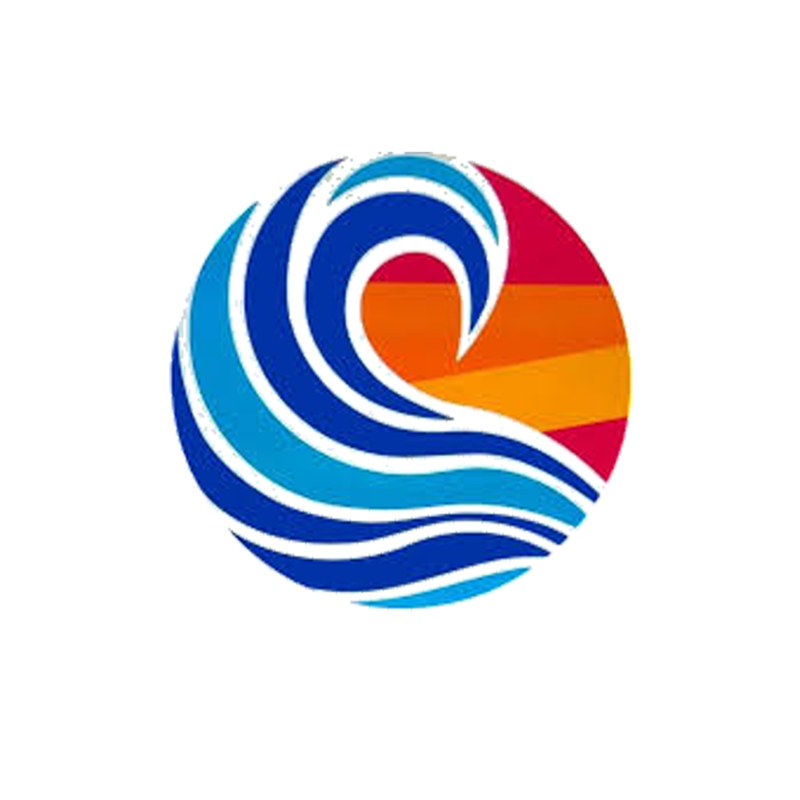 It is a privilege to hold this most rewarding job”. Rosie finished by proposing a toast to the Rotary Club of Lochaber. On behalf of the Club, President Donald thanked Rosie for this insight into fish farming and continued “you have shown how a woman in a man’s world can make a difference”. The audience responded with warm applause.